All of our packages include round-trip airfare from Los Angeles by default, however, any of our packages can be customized for business/first class air, no air tickets, or tickets from other cities. For more information on getting to and around New Zealand, click here. When comparing our hunting packages to those from other companies, check to see if theirs includes airfare. Because of our air contracts and the excellent relationships we have with our outfitters, often our package WITH airfare is about the same price as others' offerings WITHOUT air! With access to many of the nation's finest private ranches and game estates, Don Cameron has the ability to put together some of the best hunting combinations for the outdoor enthusiast. The hut and cabin based accommodation is very comfortable and will make for some great stories around the fire each evening. 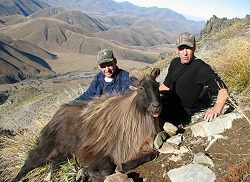 Donald and Barbara Bray will be your host on one of the most exciting hunts you will ever go on. 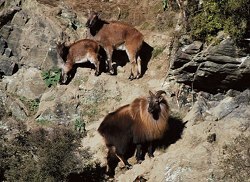 Expect to see over 40 Bull tahr a day to choose from. 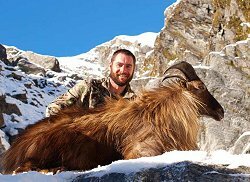 The property is over 12,500 acres with some world class tahr and Chamois. 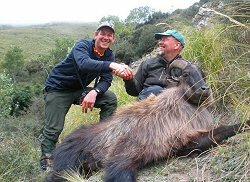 For those discerning hunters that want to stay as far away from the canned hunt as possible, New Zealand has hunting opportunities that are unrivaled in most destinations around the world. 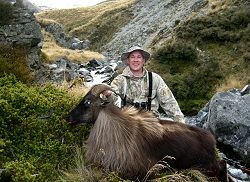 The Kiwi Classic Hunt is a hunt that offers the extreme reward of hunting in the incredibly challenging environment of the Southern Alps of New Zealand. 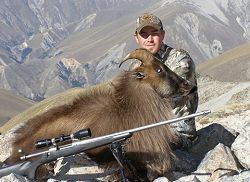 Hunt from the beautiful Haupiri Valley of the South Island to the magnificent Southern Alpines and take home a terrific selection of trophies at a great price: Silver Medal Red Stag, Bull Tahr, Chamois, Arapawa Ram, Feral Goat. Splash out and save with this exciting 7 day adventure. 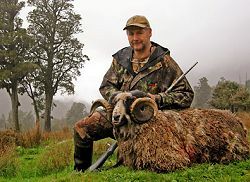 All Grand Slam hunts occur on the beautiful South Island of New Zealand. Best months are May, June, July. Gold Medal Red Stag, Gold Medal Elk Wapiti Bull, Fallow Buck, Tahr, Chamois.